Spend a day exploring Colchester's rich mix of art and culture. Fill your morning in the town centre galleries, before heading out further afield where you can discover the landscape that inspired John Constable and Thomas Gainsborough amongst others. Stay for the evening, and you can catch a show at one of the Colchester's theatres. Firstsite is a cutting-edge multimillion-pound visual art destination, located right in the heart of town. This cultural attraction showcases the work of regional, national and international artists, and frequently puts on cultural activities and shows. The Minories Galleries is a professional contemporary art gallery housed in a Listed Georgian building. The gardens, together with the folly within them, provide a delightful setting to appreciate the building and art work all with the option of a delicious lunch or afternoon tea from the onsite Tiptree Batte-Lay Tearoom. Colchester's pedestrian subways, along with some other locations, are decorated with recently restored concrete murals by Joyce Pallot and Henry Collins. They tell the story of the town's history and highlight important historical figures from the town's past. Colchester is fortunate in being able to offer groups a wide range of high quality evening entertainment to suit all tastes. The award winning Mercury Theatre stages an exciting and varied programme, much of which is produced in-house by the acclaimed Mercury Theatre Company. In addition the Mercury regularly plays host to touring ballet and opera productions, comedy, jazz and popular music. Housed in St Mary's Church, Colchester Arts Centre also attracts many of the big names in comedy and jazz and is the area's foremost venue for folk, and the Headgate Theatre down the road also puts on shows. Charter Hall is another flexible space that can stage everything from full orchestras to one-man shows. Art gallery displaying fine detail watercolours by John Harrison, Originals high quailty prints and greeting cards for sale. Tea room providing teas speciality, coffees, lunches, snacks and cream teas. Closed on Mon & Tues.
Grange Barn stands as a reminder of the once powerful Coggeshall Abbey; with ancient pillars soaring to a cathedral like roof. The home of live music, comedy, theatre, poetry, dance, children's shows, clubs, farmer's markets, gigs and more. Set by the River Stour, Dedham is in the heart of Constable Country. It was here that Britain's greatest landscape artist went to school. Dedham Art & Craft Centre is housed in a converted church in this popular village. The Centre exudes historic charm and is the perfect place to visit, shop and eat. Located just north of the High Street and includes: Maidenburgh Street, West Stockwell Street, East Stockwell Street, Stockwell Street, St Helen's Lane, Northgate Street and Nunn's Road. Celebrating the changing role of railways in the Eastern Counties since they arrived in the early 19th Century, through their glory days of the early 20th Century to the disappearances of the Beeching era. A delightful 16th century cottage just minutes from Flatford Mill. Why not visit our Constable exhibition then sit by the river and enjoy a freshly baked cake at the National Trust tea room and find a gift in our shop. The Archaeological Park is one of the most significant Iron Age and Roman sites in the country. Enjoy a walk and discover the highlights of the site with the interpretation boards around the Park. Colchester's only surviving Saxon building which has an arrowhead (triangle arches) doorway in the tower and features re-used Roman bricks. 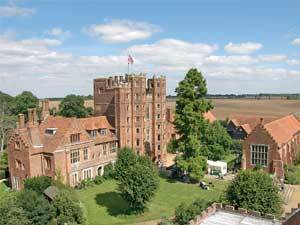 Kentwell Hall in Long Melford, is Suffolk’s hidden gem and one of England’s finest Tudor houses that stands within the most extensive moat in the county and over 30 acres of gardens and ground. 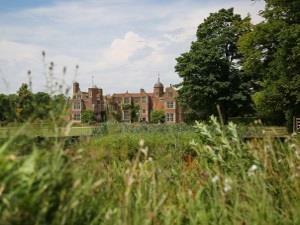 Kentwell offer a yearly calendar of events. Magnificent Tudor building with the tallest Gatehouse in Britain and 16th century Italianate terracotta. Climb the tower, visit the gardens, outbuildings dolls house, church and farm animals. Cafe and shop.